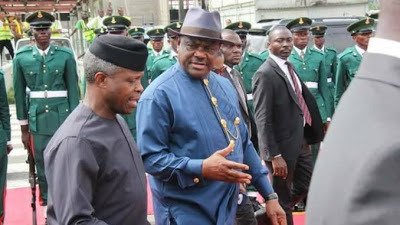 Rivers State Governor, Nyesom Ezenwo Wike has called on Acting President Yemi Osinbajo to sack the Acting Chairman of the EFCC, Mr Ibrahim Magu for overthrowing the Governments of Benue and Akwa Ibom States. In an interview with journalists yesterday at the Government House Port Harcourt, Governor Wike said the freezing of the accounts of the two states is more grievous than the invasion of the National Assembly by the sacked Director General of DSS. He stated that the unconstitutional freezing of the accounts of the two states is tantamount to the closure of the Executive, Legislature and Judiciary of the two states.